Adjusting to life in a new culture can be especially difficult when it comes to using names. For newcomers here, U.S. names can be particularly tricky because of the many immigrant languages coming into this country. On the other side, Americans who have foreign-born co-workers can also be confused by names which seem unfamiliar to them. So, what to do? Well, the first thing NOT to do is to shorten someone’s name without permission. Likewise, don’t give someone a nickname without asking them. Instead, try to learn that person’s name. Ask them for help in saying it. Maybe you can write it down. This past year, I learned about a great software program that helps in pronouncing tricky names. It’s called audioname, and it can attach itself to your website or your email. Clicking on the link plays a recording of your voice telling how to say your name correctly. 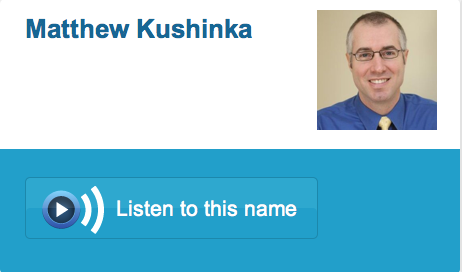 In the case of my friend Matthew Kushinka, I just click on the letter @ and he says his name. For my American friends, please take the time to learn the names of your international co-workers. It shows respect for them and a willingness to honor that sweetest of sounds—their name.